"I called her and said, 'We've been waiting for you for so long to come along.' We both started crying." 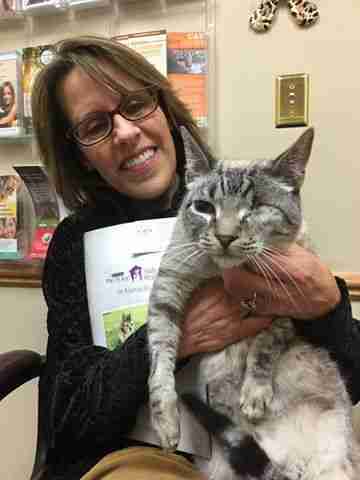 Nancy Hutchinson still cries when she recalls the adoption application she received for a certain one-eyed cat. The best kind of tears. "After two years, this is the one," she tells The Dodo. "I was just so overwhelmed with emotions. I'm crying now. I love that cat." 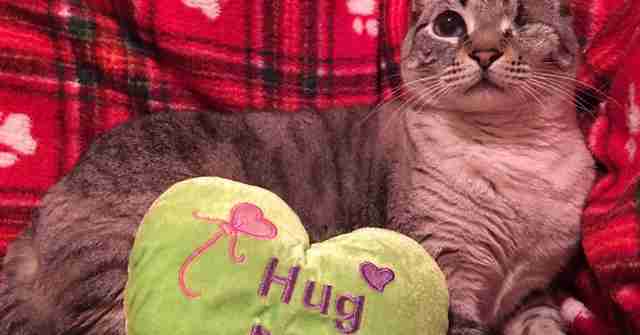 Hutchinson, who is the founder and president of Michigan Cat Rescue, had been fostering Apollo ever since she pulled the heartbroken cat out of a kill shelter. She doted on him. But with each passing day, it seemed finding him a forever home grew further out of reach. You see, Apollo wasn't perfect on the outside. 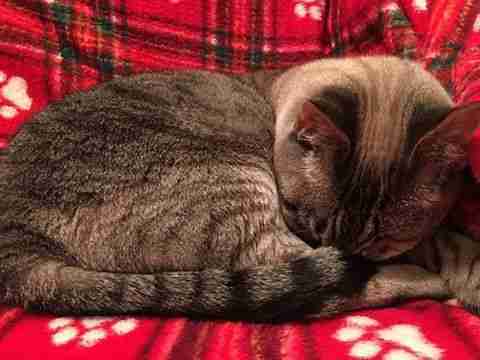 He was not only a senior cat, but a severe infection eventually cost him his left eye. For a lot of people, it wasn't the stuff that adoption dreams are made of. And for his part, Apollo was still recovering from another kind of nightmare. He had already found his one-and-only. The cat's former owner had raised him since he was a kitten. They probably figured they would grow old together. Only Apollo's owner got older - and eventually had to move into a nursing home. 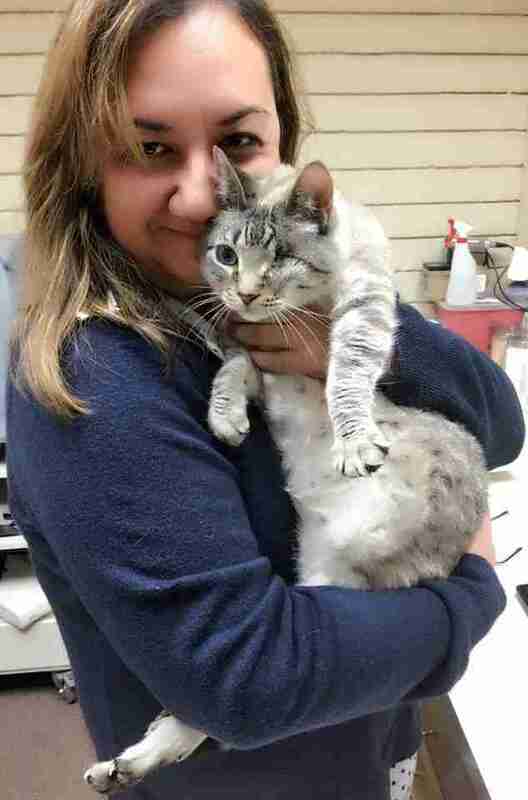 The cat was surrendered to a Michigan shelter. That's where Apollo started to come apart. And where, just in time, Hutchinson happened to find him. 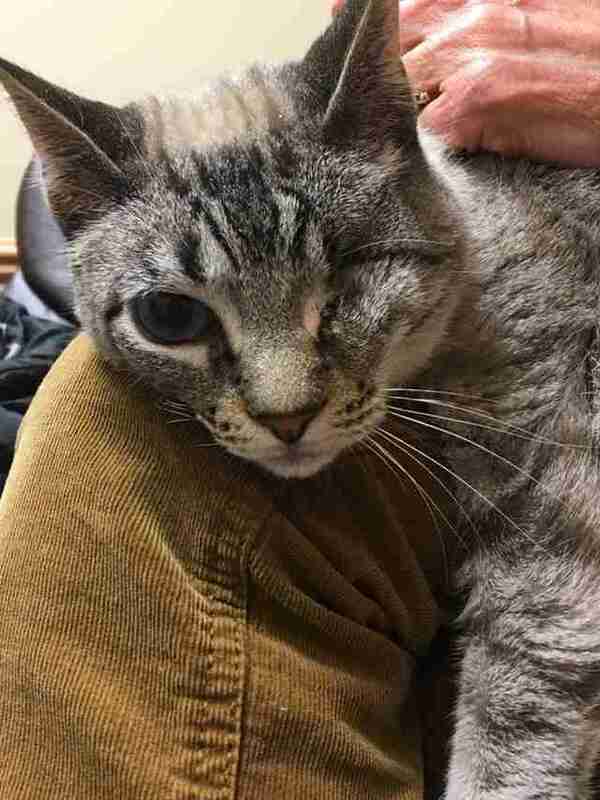 "I just happened to go into the shelter that day just to look around and I saw this beautiful cat sitting there," she recalls. "He had been there for a while. Probably a good two months. It's a high-kill shelter and they felt sorry for him so they didn't put him down yet - they kind of kept him longer to give him extra time." But all the care in the world, it seemed, couldn't put Apollo back together again. 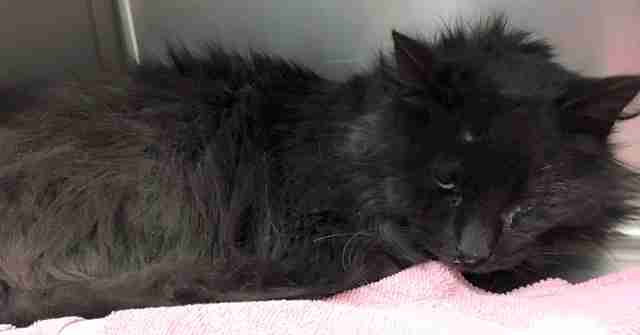 In fact, once home with Hutchinson, he developed an upper respiratory infection. And pneumonia. 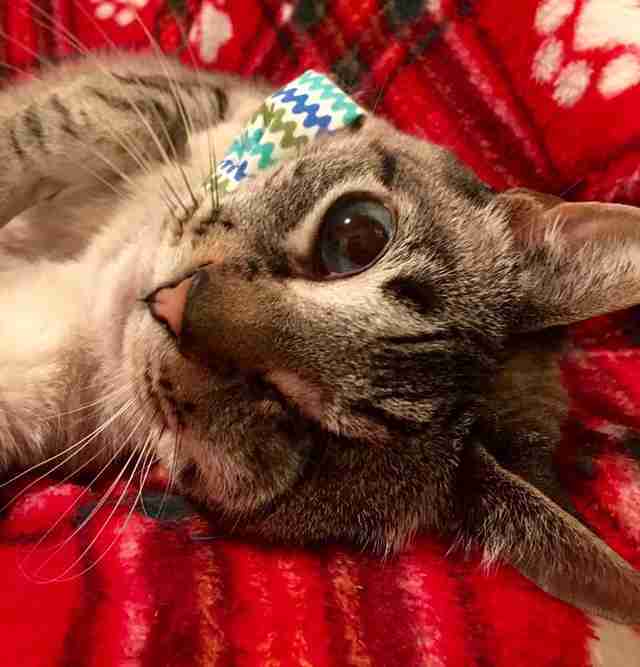 His eye became badly infected. Veterinarians, medications ... nothing was working. "The eye basically ruptured in his head," Hutchinson says. And suddenly a senior - already a tough proposition to find a home for - became a senior cat with one eye. "I recall one time in particular a lady came up to him at an adoption event," Hutchinson says. "He was sitting in a cage and she told him to his face that he was ugly. "I truly believe that he understood her because he put his head down. I could tell that he felt bad and it made me cry." 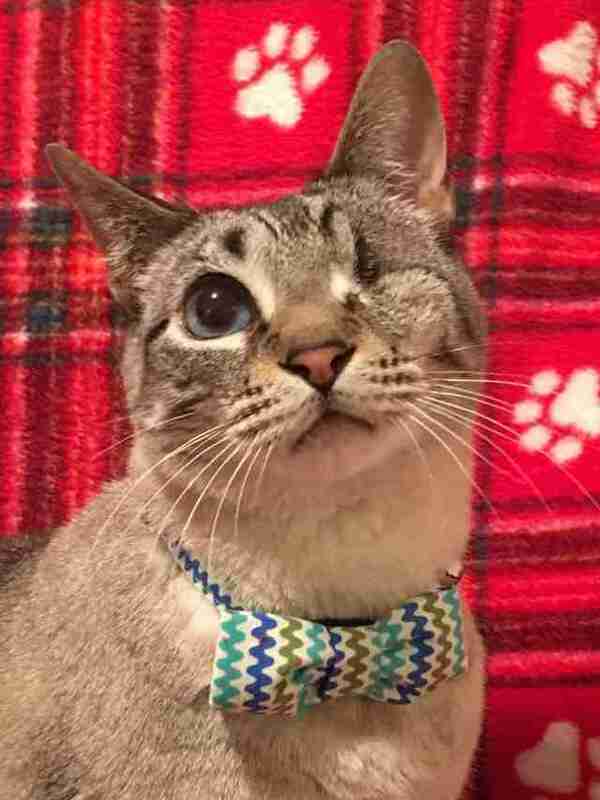 Hutchinson tried everything to find Apollo just the right home, listing the cat with adoption sites like Petfinder and sharing his plea widely on social media. She even paid to have a post about him boosted on Facebook - an unusual effort for a cash-strapped volunteer-run rescue. That post ended up reaching 130,000 people. And a fresh wave of adoption applications came in. But Hutchinson, who adored Apollo, scrutinized each one with particular care. "We're very selective about who we give our cats to," she says. "We want to make sure they stay indoors and go to a nice family who's going to take care of them. Otherwise, we do all this for nothing." It was from a woman named Denise, who lived alone in Michigan. She was in her 50s, financially secure. But there was something else - something Hutchinson couldn't quite put her finger on. "I don't know what it was, but I just started crying and thought, 'This is the one,'" she says. "I called her and said, 'We've been waiting for you for so long to come along. We both started crying.'" Last week, Apollo met Denise, who was so excited she forgot her cat carrier. More tears. Again, the best kind. 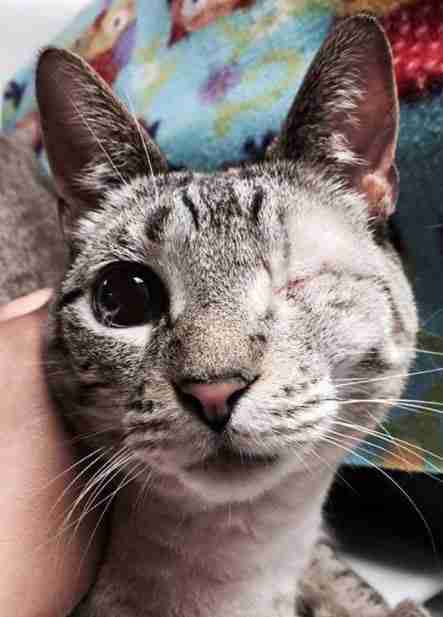 And then, Apollo, the one-eyed senior cat - Mr. Unadoptable - became the lucky cat who gets to resume growing old with the second love of his life. "He waits by the door for her when she comes home from work. He sleeps next to her," Hutchinson says. "It's a happy ending for him." But not for countless more cats still searching for families who can't look past their age. "So many cats are like Apollo who need someone to come along," Hutchinson adds. "They're not perfect cosmetically, but they have beautiful hearts, beautiful souls and truly deserve a second chance." And rescues like Michigan Cat Rescue never sleep. In fact, just days after Apollo found his forever home at last, another cat is arriving to take his place. That would be Uno, the new old cat who will be looking for a home after he gets desperately needed surgery. Like Apollo, Uno's owner died. And he, too, was waiting for a lifeline at a Michigan kill shelter. Hutchinson is rescuing him just in time for Christmas. Want to help? Visit the Facebook page for Michigan Cat Rescue to find out how. And consider taking home a cat who's waited longer than most for a real home. Visit Adopt-a-Pet.com.